I’m not that into rice pudding. I’m really not. So, when I heard that I needed to try the rice pudding at Lazy Ox Canteen in Los Angeles, I didn’t give it a second thought. Thank goodness not everyone is as chocolate-focused as I am when it comes to dessert. On visit number three, a dining companion ordered it and I got a bite of what is now possibly my favorite dessert in any restaurant in Los Angeles. It is unlike any rice pudding I have ever had. It is light and fluffy and most importantly, lacking the gloppy quality that I associate with rice pudding It is so good that it set off a month-long craving and a newfound need to sample rice pudding wherever I went to see if I had been wrong all this time and was ignoring a dessert that I should actually love. I was not wrong. I do not like rice pudding. I threw away the rice pudding from my otherwise favorite market on Third in Los Angeles and never took more than one bite of the stuff anywhere else. It always has that gloppy consistency and glop is not appetizing. So, as one of my last meals in Los Angeles before moving to New York, I returned to the Lazy Ox in an effort to quell the rice pudding craving. A month of hankering had not grotesquely raised my expectations; it was even better than I remembered. I tried to sweet talk the waiter, but he wouldn’t offer forth so much as a hint. I then stooped lower. I waited for my boyfriend to leave the table, put a big smile on my face and let the waiter know I was moving to New York and wouldn’t be able to return to eat rice pudding for a year (poor me). Still no movement. I pushed harder and pleaded with him, letting him know that I was moving to attend culinary school and wanted to be a food writer and I was sure there was some whipped cream folded in at the end, but what else was going on that made this rice pudding such a standalone…nothing. Enter Twitter one month later. I was checking my feed and noticed that Krista Simmons of the L.A. Times was on her way to Lazy Ox. I immediately messaged her to let her know that she would be my hero if she could secure the rice pudding recipe for publication. She then responded with surprising news. Noelle Carter had secured the recipe and it was already published. If you are a measly culinary student begging a waiter for even just a hint at the recipe you get nothing. If you are Noelle Carter, head of the L.A. Times test kitchen wielding the power to provide a restaurant with mass amounts of publicity through publication in the L.A. Times food section, you get a full written recipe. Have I mentioned that I want to be a food writer? Thank goodness for Twitter and that I happened to see that Krista Simmons was heading to Lazy Ox. I had missed the Culinary S.O.S. column the week the rice pudding was included because I was coordinating my move to New York. I am certain I would have found it eventually when the craving struck and I again tried a desperate Google search for any semblance of a recipe, but now I have been saved the trouble, and you, dear reader, are about to experience dessert bliss. Seriously. Make this now. I do not care if rice pudding isn’t your thing. It wasn’t mine and I think I would be happy eating only this dessert for at least the next year or so. Make it! And thank Noelle Carter for getting us what I was unable to secure. Rinse the rice several times until the water runs clear. 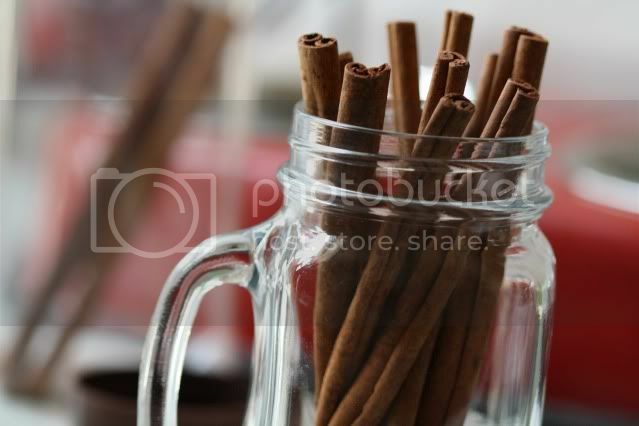 Bring the 2 cups of water, cinnamon stick and a pinch of salt to a simmer. Add the rice and simmer until of the water is absorbed, about 10 minutes. Add the half and half and bring to a boil. Reduce to a gentle simmer and cook for 30 minutes, occasionally stirring to keep anything from sticking and burning on the bottom of the pan. Stir in 1/2 cup of cream, the brown sugar, condensed milk and vanilla. Continue to simmer 20 – 30 minutes until the mixture is very creamy and the rice has no bite. Remove from the heat and add up to another 1/2 cup of cream if the mixture is too thick. The pudding will continue to thicken as it cools so you want a loose consistency. Place plastic wrap directly on the surface of the pudding and chill until firm (overnight in my case). Fold the whipped cream into the rice pudding to achieve a light and fluffy consistency. 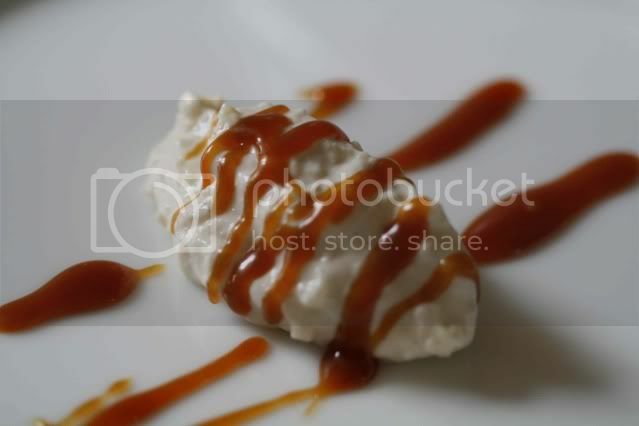 Spoon into bowls or shape into quenelles (as pictured above and demonstrated here) and drizzle with caramel sauce (recipe included below). Place the sugar and water in a medium saucepan and bring to a boil. Reduce to a simmer and cook until the mixture caramelizes to a light golden brown. Keep a pastry brush in a glass of water nearby and occasionally brush the sides of the pan to keep sugar from crystallizing on the sides. While the caramel cooks, place the cream and orange peel in a separate saucepan. Scald the cream and set aside to steep. As soon as the sugar caramelizes, use a wooden spoon to slowly stir in the butter. Remove the orange peel from the cream and slowly add the cream to the caramel. Season the caramel with a pinch (or two or three in my case) of salt and set aside to cool slightly. A fun story about the recipe. Jessica's perseverance pays off once again. Generally, I love rice pudding. My mom used to make it for me when I was sick, so you know, it's all comforting and stuff. This sounds over-the-top fantastic, though! Oh thank goodness. Here I thought I was the only one not into rice pudding. I, too, thought I was missing out on something grand but couldn't seem to reconcile it in my head. But, since you've tried it and liked it, I'll have to endeavor this one myself sometime soon. When the heat goes away. This is one super elegant rice pudding. I wish I could sink a spoon into a bowl of this right now. I actually like traditional rice pudding. The first time I had it, I thought it was amazing! I asked my mom (I was a teenager at the time) why she had never made it, and she said she didn't like it. Since then, I have also had it in an Indian restaurant in Pasadena that I liked, though it was much different. Quennelle-styled with whipped cream sounds FANTASTIC! I am definetely making this. love rice pudding! when you say, add rice & simmer until the water is (?) absorbed- about 10 minutes. do you mean completely, half way, almost completely- i think there was a word missing. Please let us know. clearly, i'm not the only one dying to try this recipe. lulibelle - until most of the water is absorbed. Thanks for catching that!